Methods to effectively manage cash and risk exposure, reduce costs and express tactical views. Synthetic equity index (delta-one) exposure can be attained through futures, ETFs, or total return swaps. Each product differs in operational efficiency, associated risks, and costs. However, investors often use cost as the primary focal point when comparing each of these instruments. In the analysis that follows, we describe the associated costs to equity index futures, ETFs, and total return swaps. We then give numerical examples of the costs associated with delta-one exposure to the S&P500, Russell 2000, EURO STOXX 50, and Nikkei-225 indices for a holding period of the prior 12 months with investment notionals of $25mm, $50mm, and $100mm. All costs used in the analysis are indicative only. Despite the focus on costs, ultimately, an investor’s choice between futures, ETFs, and swaps will depend largely on their own requirements, preferences, and constraints. Based on data over the last year, ETFs have offered lower costs for delta-one access. In our view, futures continue to trade rich due to increased restrictions on sell-side balance sheets and persistent outsized demand to be long futures amidst a secular equity bull market. 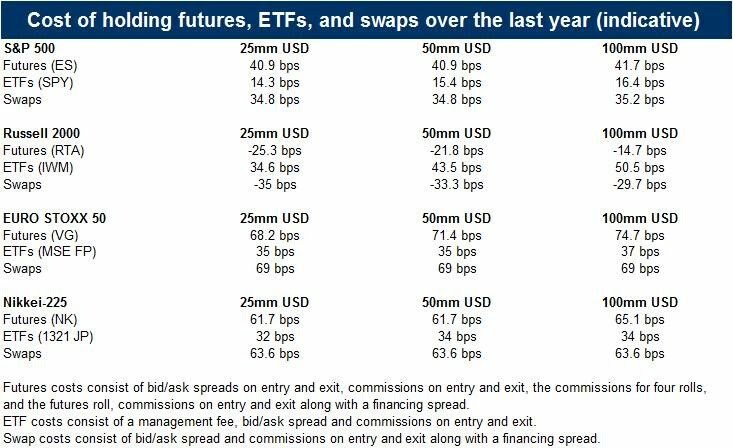 Notably, swaps have traded slightly cheaper to futures. Swaps collateral can vary while futures collateral is determined by the exchange which can potentially contribute to more competitive swaps pricing over the prior year. Synthetic equity index (delta-one) exposure can be attained through futures, ETFs, or total return swaps. Each product differs in operational efficiency, associated risks, and costs. ETFs are traded on the exchange and require the most collateralization (and therefore offer the least leverage). ETFs require reinvestment of distributions. Futures are also exchange listed but require less collateral. On the other hand, futures require management of a contract rolling process. Swaps are over the counter which then allows for customized contract specifications. However, swaps require monitoring of counterparty risk and have less flexibility for early termination. Futures, ETFs, and swaps also have varying risk considerations. ETFs and futures are subject to tracking error. Since futures trade for longer hours than cash markets, there can be differences between theoretical fair value and the actual closing price of the futures from a mark-to-market perspective. But on the other hand, longer trading hours allow futures holders to hedge market events occurring globally during off-market hours. Futures are also subject to dividend forecast errors and interest rate differentials. Swaps are less at risk from tracking error and dividend forecast errors/interest rate differentials but at the trade-off of increased counterparty risk as they are only traded OTC. Traditionally, investors have used costs as the primary focal point when comparing each of these instruments. Despite the focus on costs, ultimately, an investor’s choice between futures, ETFs, and swaps will depend largely on their own requirements, preferences, and constraints. 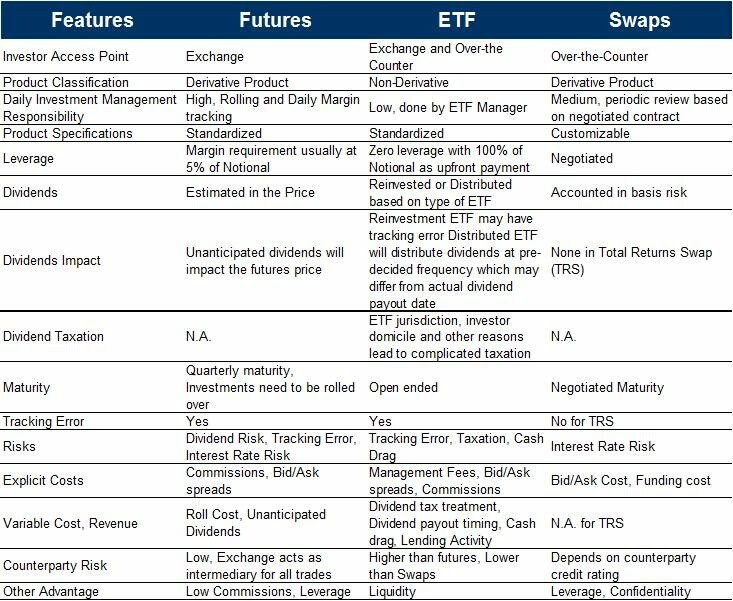 Following is a table comparing the various investment considerations for futures, ETFs, and swaps. Apart from the cost of holding the three products – futures, ETFs, and total return swaps differ on several parameters. The table below shows the important considerations for investors deciding between the products most suitable for their investment needs.